It’s odd to think that Damon Runyon, once a popular New York writer and journalist, is remembered not for his actual writing, but rather a work based on it. That would be the classic musical Guys & Dolls, with a book by Jo Swerling and Abe Burrows, based on Runyon short stories and featuring a score by Frank Loesser. 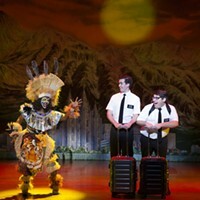 The show opened in 1950 and it’s safe to say it hasn’t been out of production since. 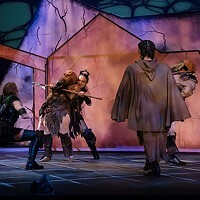 Pittsburgh Public Theater presents its version, directed and choreographed by Ted Pappas with an energetic cast of local and national performers. 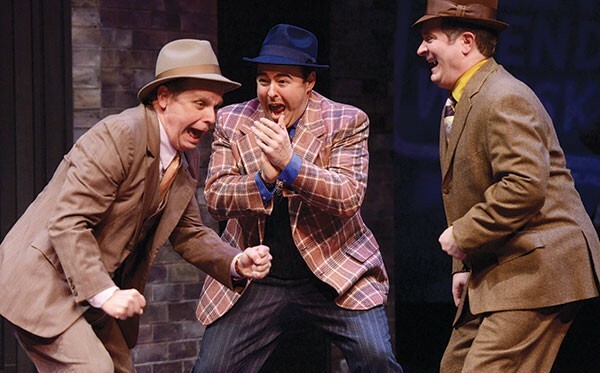 Guys & Dolls recounts the travails of two slightly shady guys, Sky Masterson and Nathan Detroit, and the dolls they’re chasing, Sarah Brown and Miss Adelaide. It all takes place in a very Runyonesque version of Midtown, with a big assortment of appropriately colorful characters. Pappas does a remarkable job fitting this show — with 1950s Broadway woven into its DNA — into a space decidedly not a ’50s Broadway house. He keeps the energy bright, and the show flies by from start to finish with plenty of snap. Joel Hurt Jones is an outstanding Nathan Detroit, the perfect blend of sad sack and schemer. Kirsten Wyatt knows where every single laugh is in the character of Miss Adelaide and she never misses one of them. 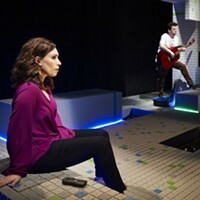 Kimberly Doreen Burns and Charlie Brady, as Sarah and Sky, have a interesting relationship onstage — his underplaying, almost to the point of disinterest, is counterbalanced by her startling ferocity, though both sing with strong, clear voices. Quinn Patrick Shannon is delightful with “Sit Down,” and he and Gavan Pamer take a wonderfully engaging turn with the title tune of this entertaining show.